A lone deer bursts through the underbrush ... panting as if being pursued. It's reflection ripples as it laps greedily at the surface of a calm, cool pond, eyes darting. A cloud passes over the sun and with a glance over its shoulder the deer splashes through the water rather than stopping to catch its breath. The wind picks up. Warm, like a summer breeze ... and suddenly the cloud isn't a cloud. It is a dreadful rain of ashes. The rustle becomes a roar and the orange glow is neither sunrise nor sunset but death. The once refreshing pond quickly becomes hazy, scummed with darkened embers. The sun is lost and the air choked and one by one, faster and faster the trees catch fire as relentless death licks at them from trunk to tip. The crunch of leaves on the forest floor becomes a bed of coals and everything turns black. James uses such a savage depiction to describe that tool with which we most often communicate. The tongue. I hate the process of being convicted. Moments before beginning my study of these verses I found out I had repeatedly rendered another voiceless by being careless with my own. The world of iniquity James calls it. 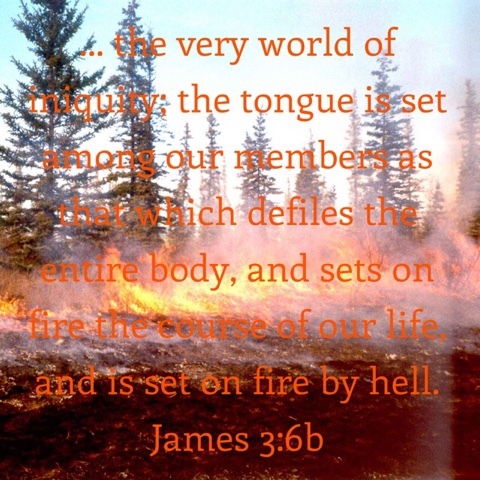 Not just "full of iniquity" but it contains the firepower to destroy on a world-sized scale. 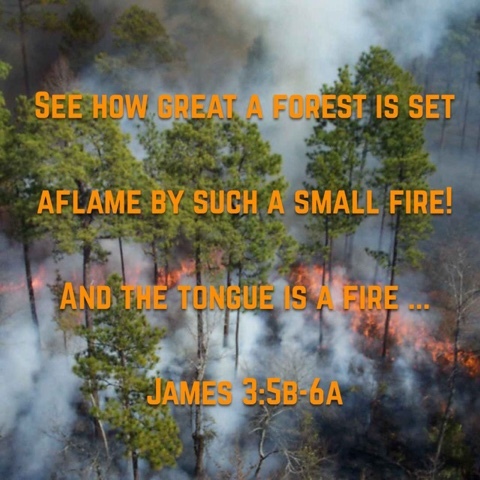 And lest we think of fire as a passion that can be useful James tells us the source of this tongue of fire ... it is no upper-room Pentecost fire but the fires of hell itself. Ouch. I do not want to unleash the fires of hell!!! I want to smother them! I want to cool the burns they leave in the lives all around me. Instead it was revealed that I have helped do the burning. And apparently I can't stop it. What then, shall I just refrain from speaking? Shall I stop writing? Take a monk's vow and become silent? Yet with the breakdown of communication comes the death of relationships. A long, slow strangling. Bitter wounds where laughter and stories once flowed. Averted eyes were gazes once locked in unspoken understanding. YES, James ... things ought not to be this way. What, would I let my praises dry up to hold back the tide-flood of cursing? Does God command that I be silent and praise Him in my heart alone? But dear. Your heart is where the curses are rooted. No! Could it be? Criticism wearing a mask called critical thinking. 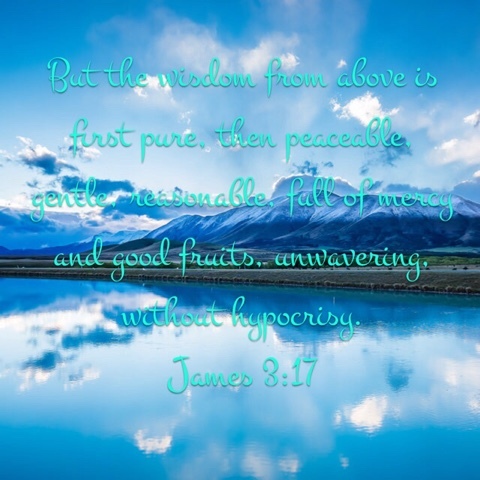 Judgement parading as discernment. Interruption labeling itself excitement. Self-importance masquarding as self-awareness. 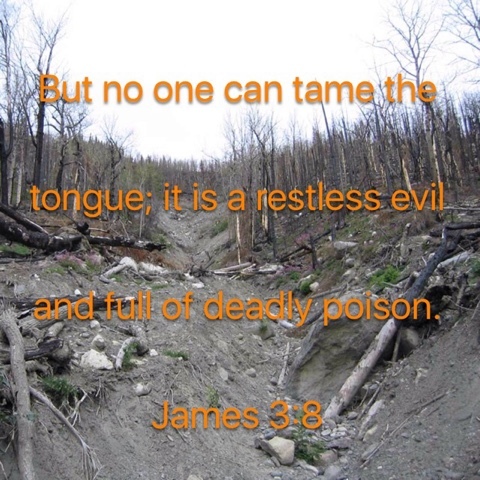 If no one can tame the tongue what is there to be done? Shall we sharpen knives and become avoxes? Mercifully, James moves on to speak of wisdom. And there lies the answer. Wisdom from above. Man may remain forever unable to tame the tongue, but God can heal our hearts. 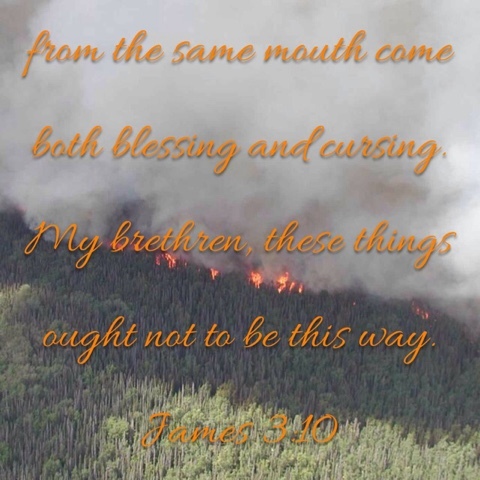 And the salty, bitter springs spilling bile and poison from our mouths will be sanctified and become pure, peaceable, gentle, full of mercy and good fruits - faithful and true as the one who masters them, if we will but let Him.